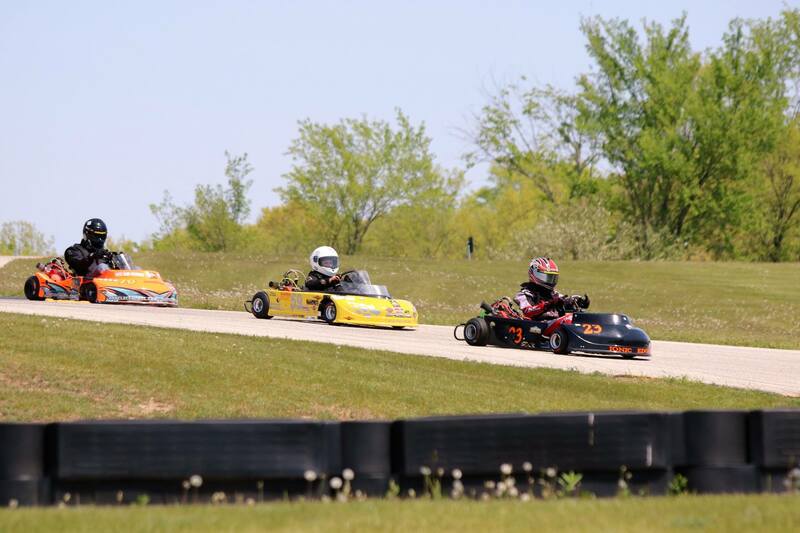 It was a two kart weekend with the Briggs and Strattion LO206 Cup and the first series race at Road America. If you ever have a chance to race or just visit Road America, I highly recommend it. Where else can you race karts and watch race cars just by turning around? 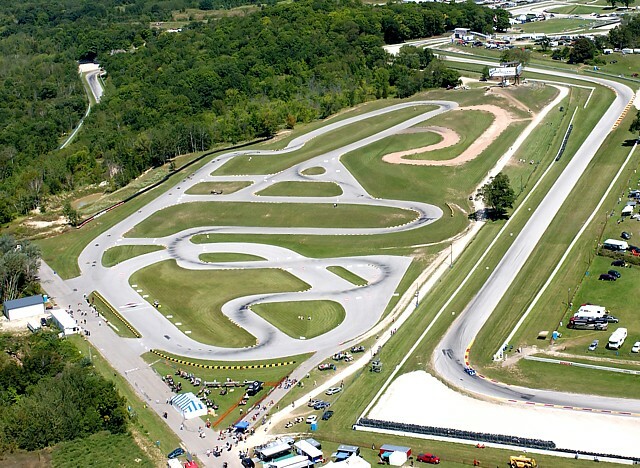 Road America’s kart track is very configurable and has a 50 ft elevation change, all surrounded by picturesq ue wooded hills and one of the best road courses in the country. Our race expectations for the weekend were mixed since we have not been very successful here due to limited practice time. But we hoped Jason will be up front in his LO206 kart. The real wild card was the Animal race. He ran a special setup with lower weight and lower horse power from the rest of the field, and he was the youngest driver. The karts should have performed the same. The real test would be if I could get the kart tuned and if he could drive well enough to stay with some very experienced and talented drivers. Friday, was all about practice, testing, and tuning. 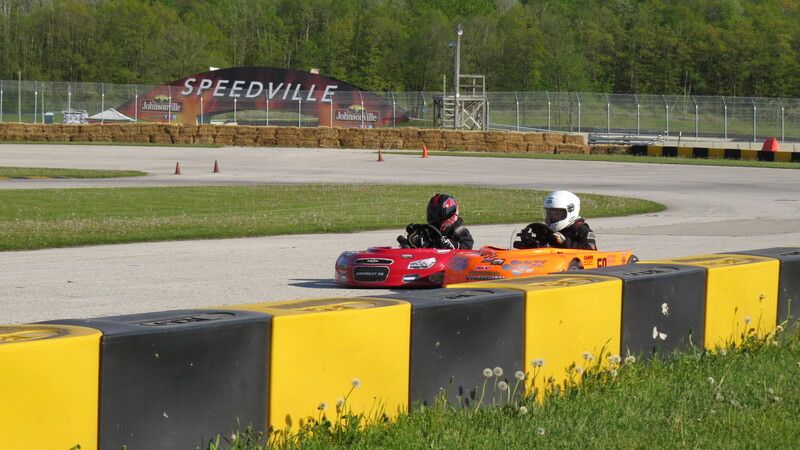 It was the first time we could try out the new Vega tires on both the karts on a sprint track. We were able to get the LO206 pretty well diaedl-in but the Animal kart was a really hard to drive. It was sticking to the track too much and Jason had to man-handle the kart around the corners as the kart jumped and skipped across the track. On top of that he grew and the Animal kart is no longer comfortable and required a pedal adjustment so he could stretch his legs out again. At the end of the day we made some progress with the Animal kart but it was still pretty sketchy. Saturday started with practice and the Animal class was first up. The kart was still really too rough to drive. Jason toughed it out but it was not going to last with the physical demands the kart was making. He qualified 5th of a tough field of 6. Both he and I were on the verge of giving up and he was really struggling keeping his emotions in check. One of the other Animal competitors made some helpful comments regarding his driving that was out his normal style, breaking hard and pointing the kart. That led me to ask Regan, of 4 Cycle Central, for advice on setup, which prompsted a tire pressure adjustment. In Heat 1, it all came together. The kart was a joy to drive, h is line smoothed out, and he was fast. You could see the huge smile on his face. 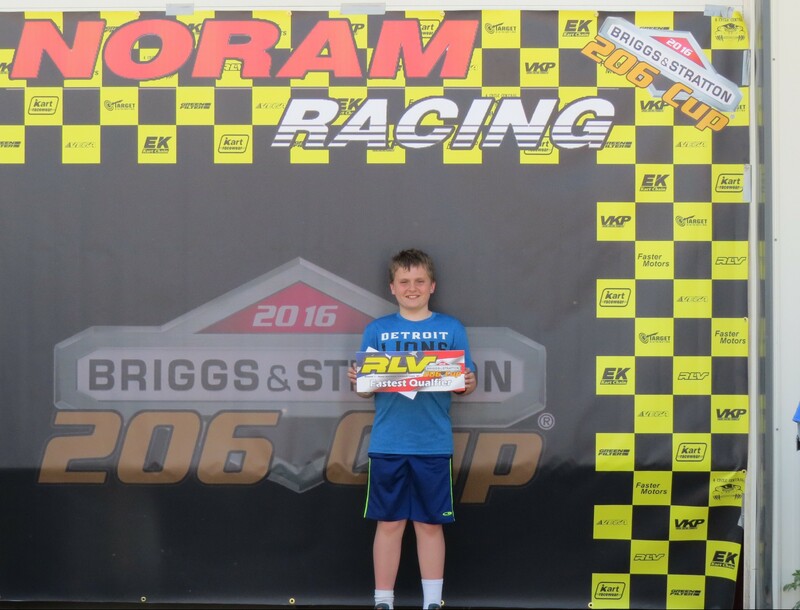 He finished in third place, only 0.34 seconds behind the leader, 0.04 seconds behind second, and 2 seconds faster then his qualifying time. Each time he went out in the kart he got faster. The second heat he finished 2nd by staying out of a tangle in the first lap and keeping pace with the leader. The feature was very exciting with Jason in the thick of the battle for one of the top spots, and each the 4 drivers in the pack making moves every lap. In the end, Jason took fourth, with all the drivers putting on a great show of clean but aggressive driving. The LO206 was running pretty well. Well enough that he qualified on the pole. Having rough starts in the heats and feature, Jason spent his time catching up and then working hard to get around the leader. Despite all his attempts, the leader was able to fend Jason off and retained the lead in each race. Really, though, it was great fun to to watch the two boys push each other to driver faster and harder, yet they kept the race clean. Never pushing or shoving for advantage. Only Jason and one other driver showed up for Sunday’s Animal qualifying. He went out and set a great time that was on par with the fastest drivers from Saturday and this gave him the pole for heat 1. While wrapping up the final laps of qualifying his kart’s brakes failed as he drove up the hill at top speed into the kink. His kart went off the track and slid for a good 20-30 feet up hill kicking up dust and grass. Thankfully, he did not hit anything and he quickly hopped out if his kart and moved to a safe area. His karts brake lines had failed and dumped all the fluid. Now there is another item on the list of things keep an eye on and inspect more often. The brakes were easily repaired, but the challenge was to make sure that Jason was OK and up to continuing the day, with 206 qualifying in just a few minutes. He was rattled and hesitant to get back into his Animal kart. I suggested that he go out and have a Sunday drive just to get back in, but he wanted to race. Once he collected himself and drove on onto the track he produced on great first heat race, keeping up with the lead pack and even taking second place for a bit. When the race was over he was all smiles and in third place. Heat 2 was similar with Jason hanging with the leaders, watching, learning, and waiting for an opportunity. He even manged to get out front and lead for a bit. For the feature he had a little trouble at the start. He was forced to the back, but kept his composure and caught back up and started pressing the lead pack. At the finish line, Jason landed on the podium in third place. He did a really great job and many people complimented him on his abilities for not only what he did, but also what he did not do. He drove just to his limits and only pushed hard enough to stretch himself, knowing that his kart may have been faster but that he was not yet ready to engage in full on battle. At his home track at Concept Haulers and the next Animal race, we might see a different, more confident driver. LO206 Sportsman from #43 (Holtz Racing) Sundays LO206 racing was very similar as Saturday’s race, just faster. 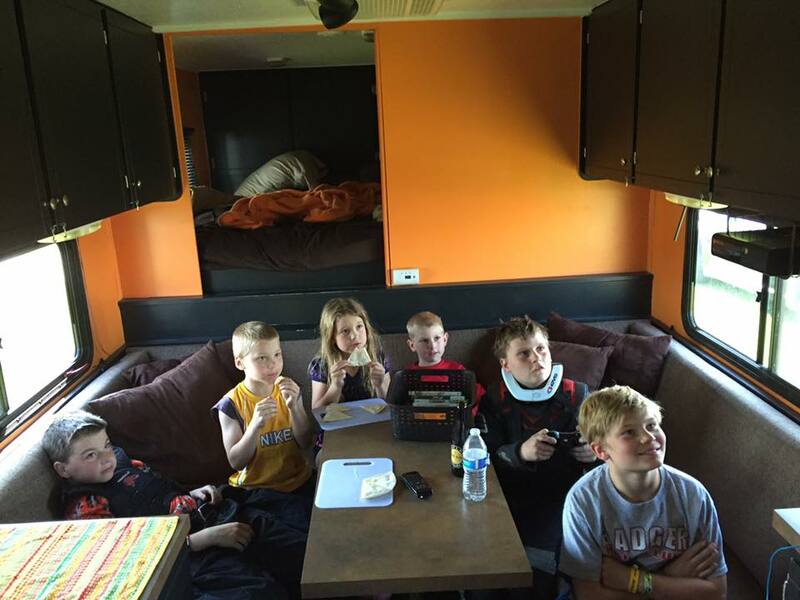 Everyone found some more fight in their bellies and speed in their karts. Jason qualifying time was affected by his run off in the Animal kart. He did not have much time to get himself together with only a few minutes between getting the “scary kart” back and getting in the LO206. If there had been more time between evens he might have had some time to process what happened. Jason did qualify second only a few tenths back, nearly a 1 second faster over Saturday’s qualifying time. For the rest of the day Jason played second fiddle in both heats and the feature, though he really drove hard, pressing for the lead at every corner. In the end it was just not meant to be. All in all he did a great job of keeping the pressure on and working to force a mistake from the other driver. Some times you can make it happen, sometimes not. 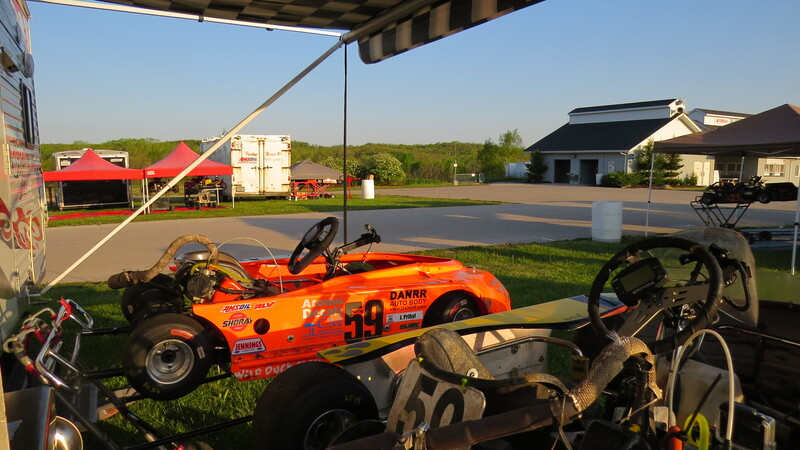 Next up for the team is a return to one of the kart racers’ favorite tracks Blackhawk Farms Raceway with the Championship Enduro Series the first weekend of June. Jason will be competing in the Animal Junior class in four 15 minute races with some of the fastest Animal drivers in the Midwest. Glodowski Motorsports gets a huge shout out for hosting the whole LO206 sportsman class, and hangers on, in their trailer. 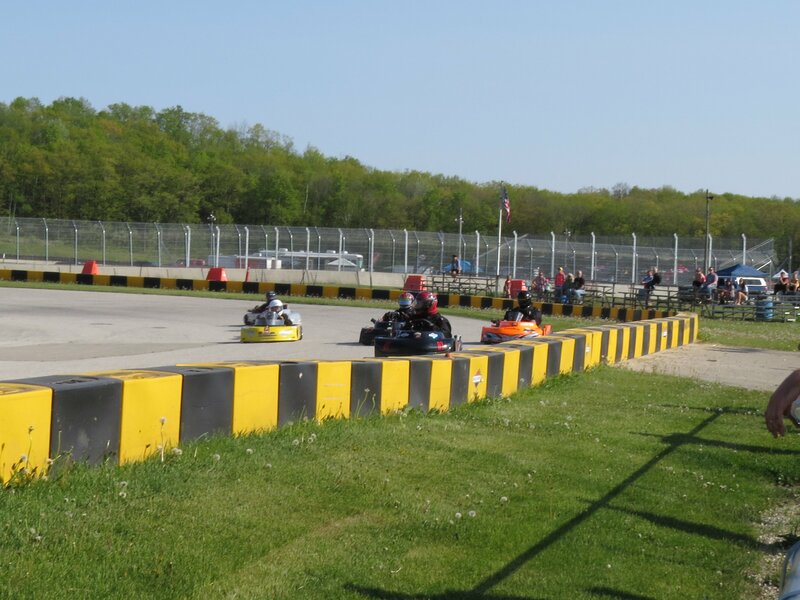 The challenge of running two classes is staying sharp, which means keeping driver and crew rested, fueled, and hydrated between practice sessions, 1 qualifying session, and 3 races in each kart with sparse time between. It would have been that much harder without their help. Karen we missed you this weekend and can’t wait for you to get back to the track and hang out with us this summer.